Beautiful 2 BR/2 BA condo only steps to the Beach! Beautiful furnished, completely updated, 2 BR / 2 BA condo in Runaway Bay, Anna Maria Island. This gorgeous vacation resort on stunning grounds between the Gulf of Mexico and Sarasota Bay has been voted 'Best Resort' by Bradenton Herald. Enjoy the large heated pool, tennis court, exercise room, sauna, shuffleboard, and a private fishing pier on the bay. Runaway Bay also provides picnic tables and charcoal grills around the property for guests to use. This Smoke free and pet free condo has tile floor throughout the living area and kitchen, and laminate in the bedrooms. The unit is fully equipped and has washer and dryer in the unit. A screened lanai in the back invites to relax. The world class restaurants, charming 'Old Florida' atmosphere, friendly people, great shopping and art galleries are just a part of what makes this island special. Come on over to Anna Maria and experience the real Florida escape. Free private Beach Access is located just across the street. This spacious two-bedroom condo had a well-stocked kitchen, and its up-to-date appliances and electronics were in good working order. You would be hard-pressed to find a cleaner unit. The ceramic tiles sparkled and the bathrooms were spotless. The bed in the master was comfortable, and while the living room furniture might not be your taste, it was fairly new, clean and comfortable. Plenty of towels and linens (though on the worn-out side) were provided as well as beach towels and several beach chairs. There were enough essentials like soap and paper products to see you through the first day. I would caution light sleepers that the master bedroom has a security light outside the window and there are no black-out blinds.The existing vertical slat blinds do little to darken the room. Bring a sleep mask. Likewise, the slat blinds do not provide much privacy in the living room. The complex although large and seemingly at full capacity was generally very, very quiet. The master bedroom was silent at night. Be aware the lanai is at a right angle to the neighbor's lanai. Any inconsiderate loud-talking neighbors could spoil the peace although this only occurred one day for us. This unit is directly across the street from a clean, uncrowded beach, and we could actually see our car from our chairs on the beach. Despite the lack of a beach view, we were happy with the location since it was unnecessary to drive and park at a beach. Excellent and relatively inexpensive restaurants are a walk or short drive away. It's less than an hour's drive (despite quite busy traffic) to shopping and restaurants at St. Armand's Circle, the Ellenton Outlet Mall or the UTC Mall; kayaking at Robinson Nature Preserve; or visiting the Salvador Dali Museum. Overall, we would recommend this condo because it was clean, quiet, well-equipped, and comfortably appointed, and because it was located in a well-kept complex close to the beach. A letter was sent about this property and stay. The complex was great but the condo itself was sub par, terrible linens, dirty bath mats and kitchen rugs, no tv for 3 days and no heat for 10days, the temperature had dropped in the 40's and there was a lock on the thermostat the list could go on The property itself was very good, the pool and short walk to the beach being able to walk to alot of places were a plus. I would consider staying there again but in a different unit and be on the first floor. I gave this rating because of the inside of condo, owner needs to step up and do some updating. Nice condo with excellent location near the beach. Well equipped with all appliances in good order. Nice pool area. Only small drawback would be some traffic noise. Would certanly recommend & hope to be back some time. Located on the west coast of Florida, Anna Maria Island is the barrier between the Gulf of Mexico and Tampa Bay. Anna Maria Island is a laid back community that has been described as 'Old Florida' with white sand gulf beaches and only one building over three stories. 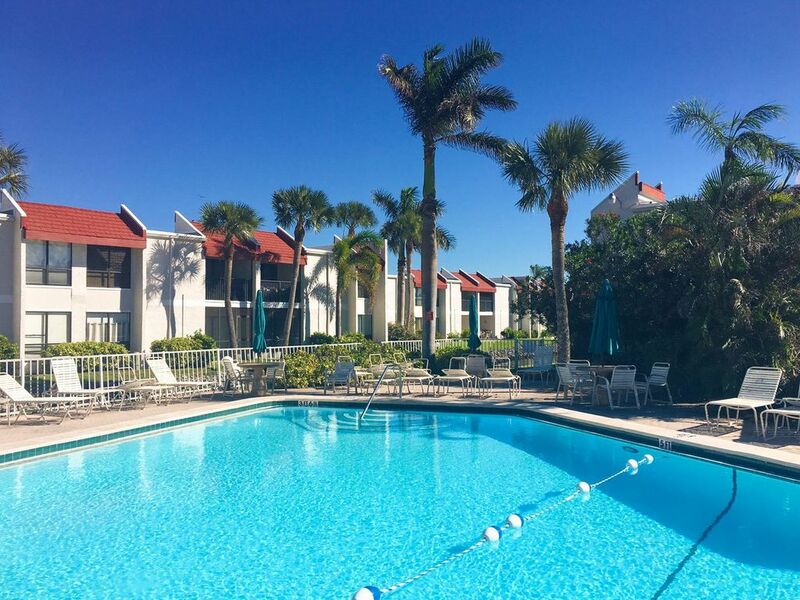 Tucked away on Florida��s Gulf coast in Manatee County and nestled between Tampa and Sarasota, Anna Maria Island is only 2 hours’ drive from Orlando, and can be a perfect way to spend a few extra days winding down from a busy theme-park filled adventure at any of Florida’s famous Universal or Disney parks. Anna Maria Island has a number of award winning restaurants. Dining ranges from quaint pubs and bars to magnificent waterfront restaurants, nearly all featuring fresh seafood from local waters. There is FREE trolley service to travel around the island. Most people visit Anna Maria Island for the exquisite beaches. Others opt for power boating, sail boarding or jet-skiing. Rentals and lessons are available.